Apple picking, cider donuts, pumpkin-head scarecrows, oh my! It’s time to break out your extra-long scarves, set the timer on that apple pie in the oven, and check out our list of Must-Do Fall Activities in the White Mountains! 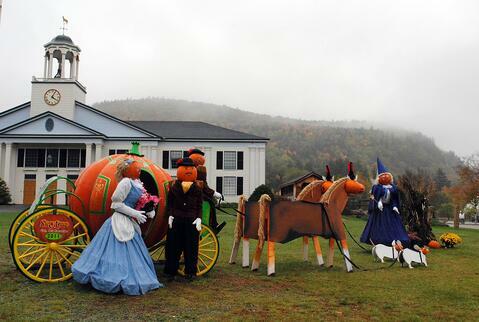 Windy Ridge Orchard is at the top of the list of must-do fall activities in the White Mountains! This family-owned and -operated orchard is open for blueberry picking in July and August and apple picking late August through early October. Also on-site is a country gift shop, cider café, farm animal ‘zoo’ with feeding stations, flavored popcorn stand, nature trails, and wine tastings with specialty wines crafted by Seven Birches Winery from Windy Ridge apples and blueberries. Well-mannered leashed dogs are allowed on the property, but not in the blueberry fields or apple orchards. 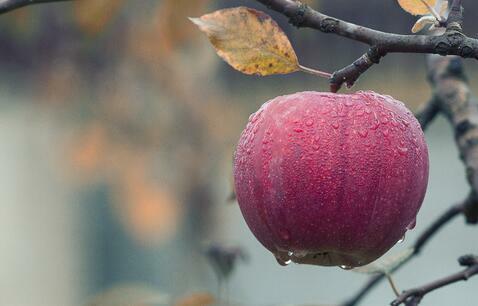 Windy Ridge apple varieties include Paulared, MacIntosh, Honey Crisp, Gala, Cortland, Macoun, Spencer, and Empire. The location of the orchards on open countryside with the surrounding vistas of the White Mountains make this one of the most picturesque places for apple picking NH and fall foliage that you’ll find anywhere. The Cider House Café offers homemade breakfast and lunch using fresh locally-sourced produce. 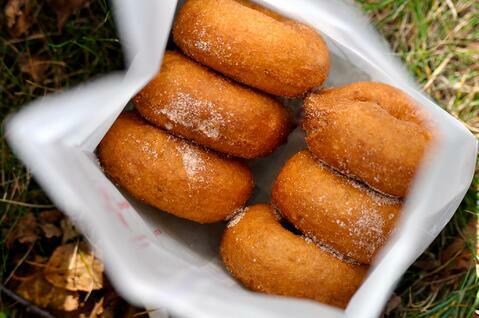 And Windy Ridge’s famous cider donuts are served all day! Windy Ridge Orchard is open daily from 7 AM to 3 PM and is located off NH Route 116 at 1775 Benton Rd in North Haverhill, NH. 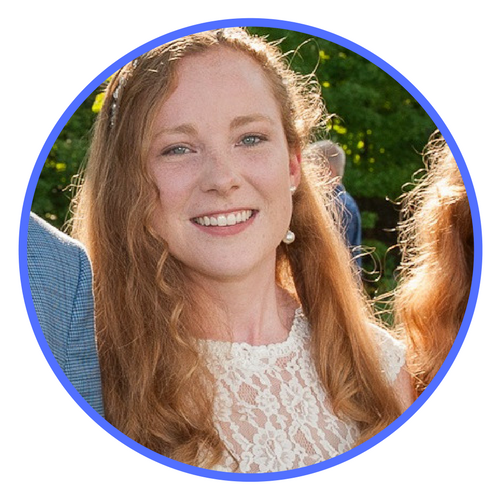 Call (603) 787-6377 for questions. 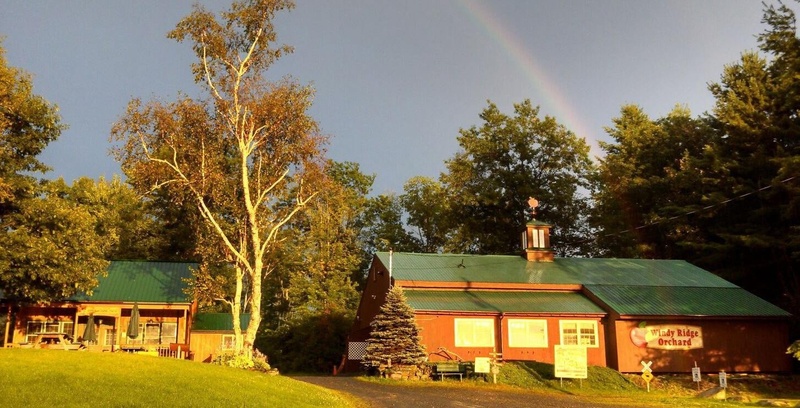 If you find yourself on the eastern side of the Kancamagus Highway this fall, you will want to plan a meal at the White Mountain Cider Company in Bartlett, NH. Owned by Culinary Institute of America graduates, this contemporary, artisanal restaurant is housed in an 1880s farmhouse serving dinner Sunday through Thursday from 5-9 PM and Friday and Saturday from 5-10 PM. The White Mountain Cider Company was also home to a traditional Cider Mill next door, where fresh cider is pressed from mid-September through early December. Unfortunately, the Cider Mill was largely destroyed in a fire over the 2016-17 winter season. Reconstruction is ongoing, and the owners are hopeful that the new Cider Mill will be open for business sometime this fall 2017. Weekend tours and samplings will be offered at the White Mountain Cider Mill when it reopens. Hatch Orchard in Center Conway is a pick-your-own apple orchard open for business from 10 am to 5 pm on weekends and holidays starting Labor Day each fall. You are recommended to call ahead before planning your trip, as Hatch Orchard is a small operation run by an older couple (and, as we all know, sometimes life happens). 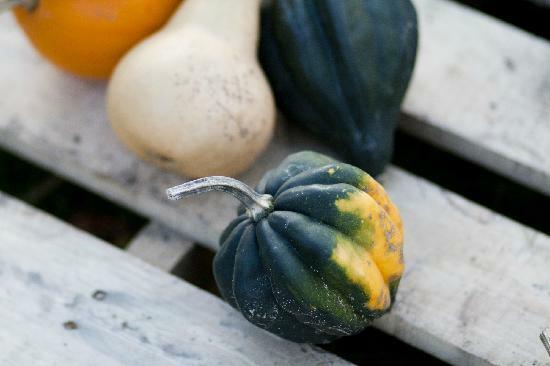 Come prepared with your own bags or buckets for holding your apples, and consider purchasing your Halloween pumpkins here as well: Hatch Orchard generally has a small collection of gourds, squash and pumpkins available from their own pumpkin patches. 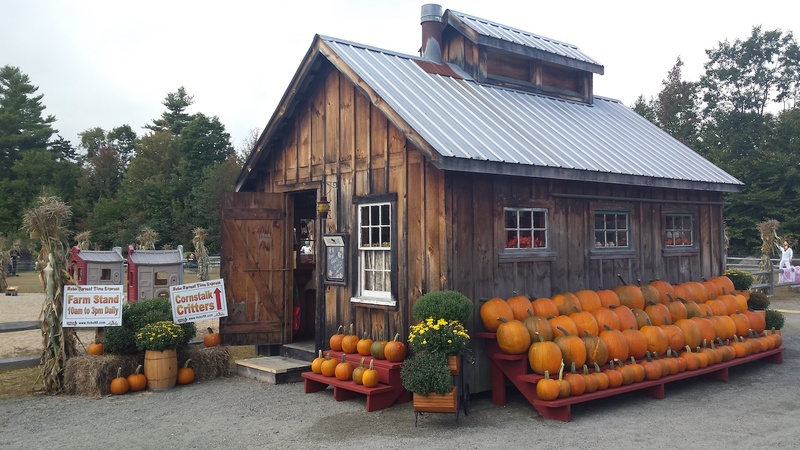 Hatch Orchard is located at 1440 Brownfield Road, Center Conway, NH. Call (603) 447-5687 for availability and more information. Franconia Notch Stables, located right next to the Franconia Inn, offers one-hour horseback rides that depart at several available times every day. These guided tours are gentle, beginner-friendly horseback rides through beautiful Franconia countryside. Mountain views in Franconia include Cannon Mountain, the Franconia Ridge, the Kinsmans and the eternally-impressive Mt. Lafayette. Chances of wildlife viewing are high, including deer, turkey, turtles, beaver and even moose, especially on an early-morning ride. The cost is $60 per person. Children ages 8 and up and invited to join. (Pony rides are available for the wee ones!) Horseback riding tours are by reservation, so call ahead at (603) 823-5058. A trip along the Hobo Railroad Express through the Lincoln and Pemi Valley countryside is always a scenic delight, but fall foliage and fall-themed activities make this season a special one to hop on board. and the Hobo Bean Bag Toss! Tickets are $20 for adults and $15 for children (3-11) and can be purchased online ahead of time. 2017 marks the 33rd year of Return of the Pumpkin People throughout and around Jackson, NH! Local businesses create beautiful and often hilarious displays incorporating pumpkins at their establishments during the month of October. The Jackson Chamber of Commerce creates a map every fall of all the participating businesses so that visitors and enthusiasts can take the self-guided tour and vote on their favorite displays. Check back to the Jackson Chamber of Commerce’s website after September 10 to download a map of this year’s Pumpkin People displays! Enjoy the remaining sunny days of summer, knowing there’s no reason to fret over the changing of the seasons: there are plenty of family-friendly fall activities to plan while you’re up here marveling at our incredible fall foliage in the White Mountains!